Shrinkable plastic such as the Shrinky Dink are really fun to use. You can cut out shapes and color them. There are also some basic colored sheets available in black, cream and brown. First up is Emilie of PluckyMomo's wonderful silhouette charm bracelet tutorial. 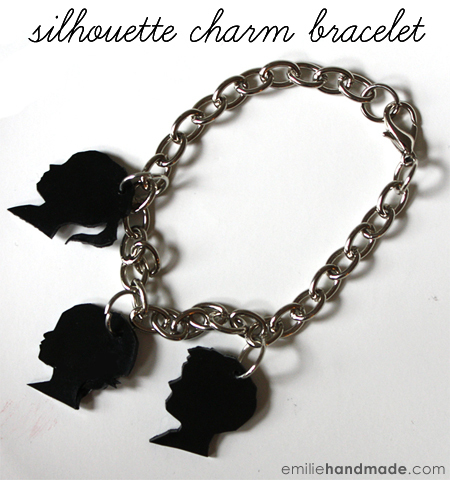 Emilie used her sweet toddler's silhouette to make the charms. Using black shrinkable plastic is a stroke of genius as it is an easy alternative to the photocopier or editing software step. 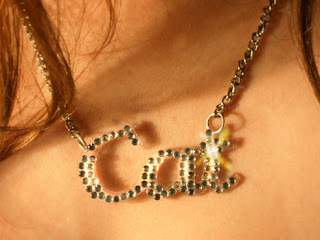 See my past post on How to Make a Silhouette Portrait Pendant. Emily V.'s 3D shrinky dink faux diamond ring tutorial on Cut Out and Keep is definitely a lot of fun to make and wear! 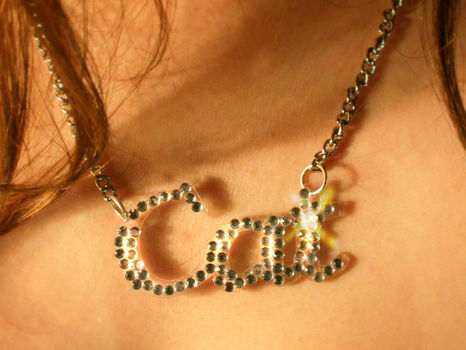 Cat Morley's Blinging Name Choker tutorial also on Cut Out and Keep requires the deft use of a craft knife. But as you can see, the shrinkable plastic forms a unique base for the glue on crystals. 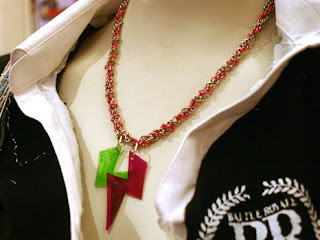 I also liked Cat Morley's vibrant High Voltage necklace tutorial which really added great color punches to her chain maille design. The solid white types of shrinkable plastic are fun to use too. 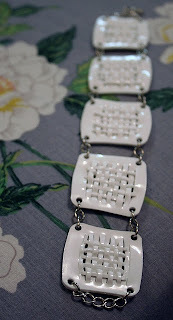 Jenny over at the A Bird in the Hand Art blog has a very clever woven shrinky dink bracelet tutorial. The crafters on Cut Out and Keep are a very creative bunch. Aurore made this Faux Tattoo necklace with shrinkable plastic. 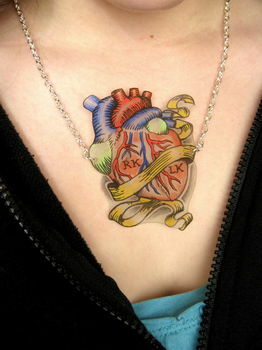 I really like this heart non-tattoo as it is easily removed! She has some great tips on how to use color pencils in her tutorial. If you don't like the look of colored pencils on shrink plastic, try Adirondack alcohol inks or acrylic paints for matte or suede like effects. Alcohol inks give a wonderful transparent effect. 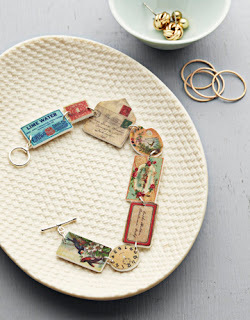 Make your life easy and use die cuts or large paper cutters and stamps. There are some great tips on how to use shrinkable plastic in this Ranger video. The instructor, Debbie Tlach uses a craft heat gun rather than a toaster oven. An invaluable tip on how to use a shrink ruler to estimate how much shrinkage to expect is included at the end of the video. Very neat designs. I haven't tried this before. To those who use this plastic - do you have a separate toaster oven for this? No. I just use the small oven I have. The low temperature is just enough to shrink (and curl) the plastic but no fumes are given off that I know of. I HAVE TO try this stuff. I love all the examples you've shown. That tattoo is really funny! Yes it has! You really ought to see the previous tutorials I wrote about! Since I'm the oldest one here (and I've the gray hair to prove it) I find myself still thinking of Shrinky Dinks as something for children. Think my girls were around the age of 8 to 14 when we first saw the TV ads for it (at that time it was marketed more for children than as a craft supply). Guess I need to step into the 21st century. Great post! One cool tip for those who are thrifty... recycled food packaging with the recycle symbol 6 on it will shrink beautifully. The plastic pie covers that I get my Costco Chicken Pot Pies in (Black bottom, clear top) work great. Just use the flat sections and you're good to start shrinking!